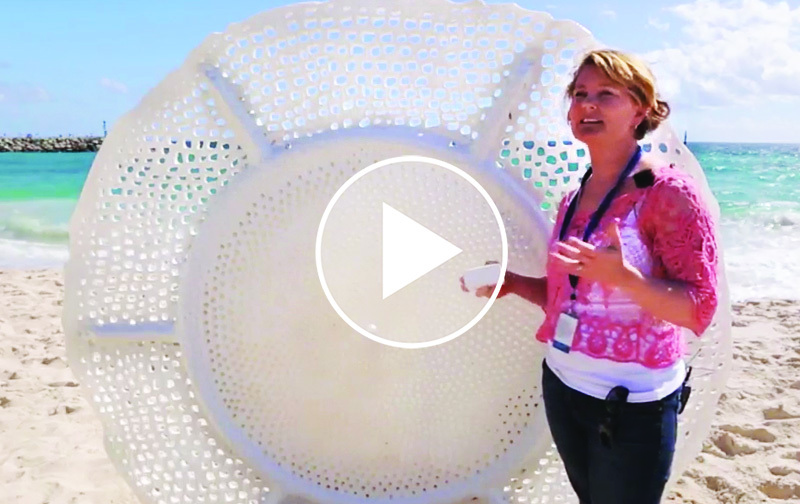 Five-time Sculpture by the Sea exhibitor and 2018 Helen Lempriere Scholarship recipient, Britt Mikkelsen, discusses the inspiration for her latest work ‘Veiled’ and her journey to exhibiting at Sculpture by the Sea, Cottesloe 2019. With the help of the Helen Lempriere Scholarship, Britt is taking on her largest challenge yet. An accumulation of five years of research and taking over 700+ hours to complete, it was a work she came very close to not completing. How do you feel about exhibiting this year? This year is extra special for me as the work is the biggest and most demanding work I have ever completed, financially, physically and mentally. The work itself is a culmination of 5 years of research in my practice and the concept has been ruminating in my head for 2 years. The design and fabrication itself has taken almost a year, as I was designing it during last year’s Sculpture by the Sea. It has been quite a difficult journey at times and I quite honestly wasn’t sure if I would even get it done early on. It has been a project that has taken a lot out of me but is extremely important in my journey so I think seeing it on the beach will be very emotional for me. I am so proud of the work and my dedication to the job and I don’t regret any part of it. What was the inspiration for your work in Cottesloe? I am interested in how robust, industrial materials can be made to look fragile and even feminine, often these two notions do not go hand in hand. For a long time, I have been enthralled by the veiled marble bust of Strazza and his ‘Veiled Virgin’. The way in which he was able to carve marble and make it look like it was soft, but also translucent is hugely inspirational to me. I wanted to see if I could achieve a similar notion with aluminium. ‘Veiled’ also questions my role as a female sculptor and the challenges I face trying to make these organic, feminine forms using materials that will last. 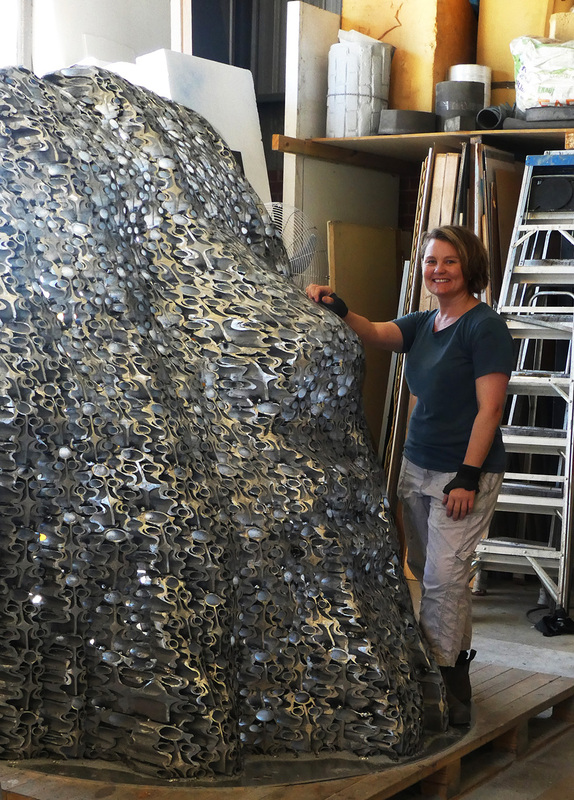 The work represents an image of a veiled woman, created in aluminium that has been welded together in a repetitive lace-like pattern. The viewer will be able to look through the work’s thousands of holes and see the world through her eyes. The work is incredibly heavy, weighing around an estimated 450kg, but the thousands of perforations in the ‘lace’ make it feel ephemeral, lightweight and feminine. What is your process; tell us more about needing to get support in the creation of your work and how you funded this? This work has taken many months of design and planning before I was even accepted into Sculpture by the Sea. Initially, a lot of computer design was needed to design the tessellated pattern and also to render the image so that the selection panel could actually see what on earth I was planning. The complexity of the form meant that drawing it accurately was completely out of the question. I had to sculpt the form in clay and have it 3D scanned in order to do the rendering. I also had to learn a new 3D rendering package. I was able to do this as part of my Helen Lempriere Scholarship, as some of the money went to upgrading my computer hardware and software and learning this new technology. So without the scholarship, I would not have been able to show the selection panel my concept. A laser cut mold was cut from these 3D scans that I could work over the top of. Thereafter off the shelf aluminium extrusions which were kindly donated by Capral were welded together in 1.5m sections that form the basis of my lace pattern. 308 individual conglomerated pieces were then hand cut with a bandsaw into complicated shapes to fit the face and flow like fabric on the front of the sculpture. Each piece was then welded together and a further 3 weeks of angle grinding refined the forms, before a trip to the sandblaster and a finishing coat of tinted beeswax is being applied. I estimate my own labour has taken around 550 hours, and the total labour hours to have been around 750 hours all up. Largely self-funded, I have also been able to secure some sponsorships from Capral, Universal Coatings and Tromes Design, that has saved me thousands. The project, however, is probably costing me $10000 more than anticipated which has been a heavy burden. Then I reached Christmas and found that my hands were failing me. Tendonitis in both wrists and trigger fingers were threatening the whole project and I was afraid that I would either have to stop completely or that the injury would slow me down so much that I just couldn’t complete it in time. With all my funds gone I had to consider a crowdfunding campaign. This allowed me to bring in some labour to help with the grinding in the closing weeks and save my wrists a bit. HOW HAS BEING THE RECIPIENT OF THE HELEN LEMPRIERE SCHOLARSHIP IMPACTED YOUR WORK? The Helen Lempriere Scholarship allowed me to complete a welding course which meant that I felt confident in tackling a large aluminium, welded work such as this. As I mentioned earlier I have also learnt a whole new way of working with digital rendering which allowed me to conceptualise this piece and I am sure many pieces in the future both at Sculpture by the Sea and also in public artworks. My trip to Tasmania has also changed the direction of my work as much of the research informed new works that I am completing for my first solo show at the Gallows gallery in February. All in all the scholarship allowed me to explore ideas and techniques that I didn’t dare to earlier as they were prohibitively expensive. As an artist, the new always carries with it the risk of failure. This is an important part of the process however, when funds are tight I find myself resorting to the techniques that I know won’t fail me. This tends to restrict the free flow of ideas. All in all that is what the scholarship has allowed me to not only conceptualise new works and methodologies but makes those a reality.